Frerichs was born in the town of Ghent, then part of the Netherlands, in 1829. From the age of six, he attended the Royal Academy at The Hague. He then attended the University of Leyden and finished his artistic training at the Royal Academy of Brussels. In 1850, he emigrated to New York. By 1855 he already had assumed a post at the Greensbro Female College in North Carolina, where a fire in 1863 destroyed his studio and his extant works. Having served in the Confederate engineering corps, he returned to the New York area after the war. 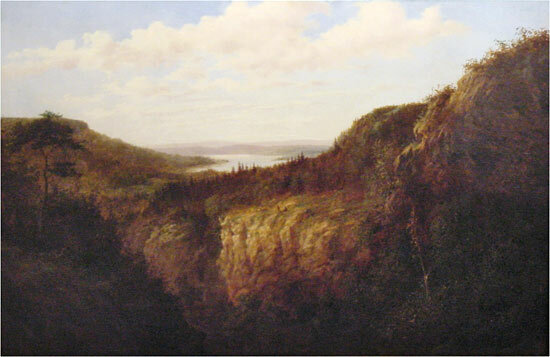 While in North Carolina, Frerichs became one of the first painters to explore and paint the gorges and waterfalls of the Blue Ridge mountains. His landscapes reflect his early interests in the artists of the Hudson River School, particularly Thomas Cole and John F. Kensett, as well as his knowledge of seventeenth-century Dutch masters like Ruisdael. He died in Staten Island in1905.